Do not get stress in searching multiple websites to create a valid User Id and password for your Dena bank net banking. If you willing to get access to the facility of internet banking of your Dena Bank account, check the steps provided below to create the online account in just a few moments. But to operate your account safely, you should follow certain guidelines like to avoid using PC to operate internet banking account through public wifi access like cybercafé. Pay attention while logging in to the website and do not remember the password for future use while using any browser. You can visit the nearest bank and submit the registration form for a valid ID and password if you do not have Debit card. Bank will take 2 days to process your request for internet banking facility. 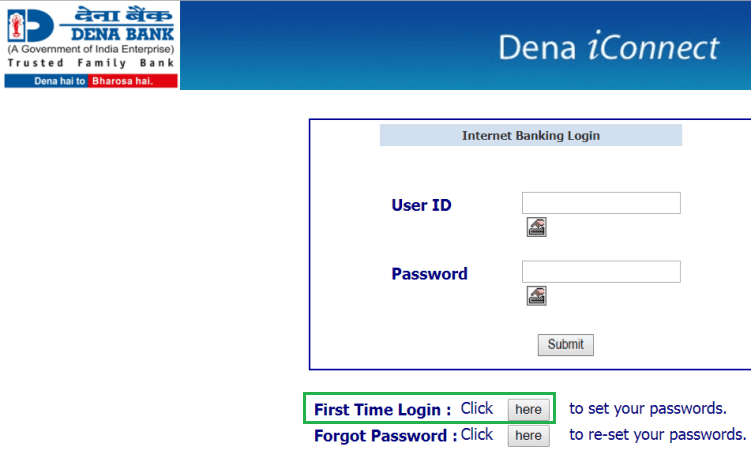 Step 1: Go to the official website of Dena bank, www.denabank.com. Click on 'services' and under online services section, you have to click on 'ineternet Banking'. Note: Before registration makes your ATM card ready for you to authenticate your bank account. Step 3: If you want to log in for the first time select 'First time login' and then proceed. Step 4: At the time of opening your bank account you may have got, 'User ID' and 'Account Number', enter these credentials in the box appeared and click the 'submit' button. Step 5: After submitting these details you will be prompted for a different page for authentication, and to proceed further keep your ATM Card ready for you. Enter the 'Debit card number', 'ATM pin' and 'Expiry date' in the box given. Step 6: For successful authentication of the bank account with Debit card, you need to authenticate by OTP method on your registered phone number. Enter one time password and click the 'confirm' button. Step 7: After confirming your bank account and OTP method, you will be redirected to next page where you can create your login password and transaction password. Once you are successful in creating the password, you will be displayed a message of the successful creation of your internet banking ID and password. Further, you can open a new window for the login of your internet banking bank account from the official site of Dena bank and enjoy the benefits of internet banking. Important Note: We always care to maintain the privacy of our customer's information, and that's why we do not ask Internet Banking id, password, or debit pin through Phone or email. Be protective while using Internet banking facility and do not share your details anywhere else apart from the Official website Dena iConnect to create the login and password. How to Make user id for Dena net banking account. 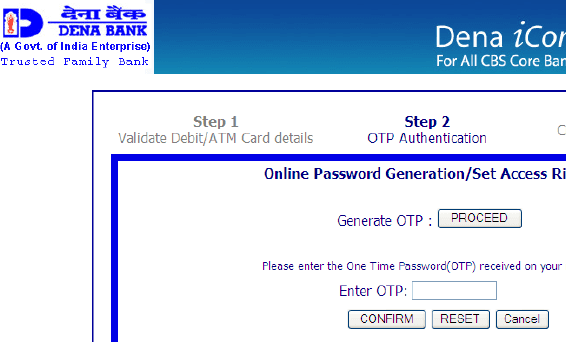 how to activate Dena bank internet banking and transfer fund to another bank. how to apply for online registration for net banking. I forgot dena bank net banking user id. How to recover user id and i lost my registered mobile number. It is showing - USER ID INVALID to me. Even though my debit card is properly activated and working, I’m unable to access the net banking. Why so?